Gerald and Amanda had made an early start on the loungers, securing a quiet corner of the adults-only sun terrace. They were making the most of each day; their dividend from the bank shares had taken another knock from payment protection mis-selling payouts, so a twelve day cruise would have to suffice this year. Amanda rested on a huge fluffy towel, paddling her toes in the pile, and arranged her floral maxi dress to expose her legs a little. Once the day had warmed up, she would uncover the matching bikini and start to work on her tan. She wondered aloud if he was enjoying himself. She smiled. ‘You think he’s her toy boy! I don’t think she’s that old.’ Gerald was putting his paper down to argue, but she hushed him. ‘Look, here they come now.’ Harvey and Jane, carrying their pool towels, were coming along the row of teak loungers looking for a good spot to sit. ‘Good morning!’ boomed out Harvey, raising a hand in greeting. He was a tall, strong-looking man, with a full head of curly grey hair and a ruddy complexion. Jane, much shorter, trotted in wedge-heeled sandals to keep up with him. ‘Would you and your wife – ’ Gerald waved them to adjacent seats, and Amanda moved her handbag slightly, not to make space, for none was needed, but merely to signify that the couple were welcome to join them. Draping his towel over a lounger, Harvey thanked them, and smiled, but Jane hastily interrupted. ‘We’re getting married on board,’ added Harvey, ‘It’s all arranged. The ceremony’s booked for this afternoon. By the time we get to Madeira I’ll have made an honest woman of her!’ He laughed heartily. ‘Oh, how wonderful,’ smiled Amanda. ‘Oh yes,’ said Jane, ‘cream chiffon, with a hat. Hopefully I’ll have the tan to go with it.’ She smiled, a gleaming fuchsia lipsticked smile, her large sunglasses masking her eyes. Her hair, dyed a golden blonde, was carefully curled. She arranged herself on the lounger, disposing her beach wrap so that her legs, already slightly bronzed, were bared to the sun. She wore a glittering engagement ring, but her hands, Amanda noticed, were gnarled, with age-spotted skin draped loosely in the furrows between the tendons. ‘And are any of your family with you?’ asked Amanda. ‘No, we’ve just had something, thanks,’ said Gerald. And he started to say how expensive the drinks were on board. ‘Oh Villamoura, the golf!’ said Harvey. ‘Our villa was right on the golf course, overlooking the fifth tee. Absolutely beautiful.’ Gerald, who had been gazing at the horizon, perked up at this, and started to talk to Harvey about golf. Before long the two disappeared in the direction of the onboard putting green. The waiter brought the Buck’s Fizz, two tall flutes on a tray. ‘Go on, Amanda, have Harvey’s before it goes flat,’ said Jane, ‘he won’t mind. It’ll only go to waste,’ she added, as Amanda hesitated, then accepted. Jane thanked the waiter, and then asked if he would mind bringing her a coffee. ‘So,’ said Amanda, sipping the drink, ‘how exciting for you!’ But Jane’s face had changed, the lines deepening at the corners of her mouth. Amanda started to say something neutral and comforting, but Jane continued, her voice low and urgent. Amanda thought carefully about what she should say. A question seemed safest. ‘How did you meet?’ she asked. Amanda saw that Jane’s body was carefully moulded by expensive swimwear. She could see the furrows in Jane’s skin, particularly in the tanned parts, the hair was thinning, revealing pale pink scalp. The lipstick had been copiously applied to make her lips seem full, and was staining her teeth – or were they dentures, so unnaturally white and even? ‘Why don’t you tell him you’re not sure then?’ asked Amanda. ‘Well, you see, at my age, I’m afraid of being on my own – I was married for forty two years. I might not meet anyone else. And Harvey gets so jealous, I don’t like to upset him. He’s on antidepressants, you know. And then, we’ve been on some lovely holidays, I’d miss that if I hadn’t got him, I don’t want to just be stuck in my house getting old. I’ve a big house, but not much money coming in, and I wouldn’t be able to have these holidays if I was on my own. We have had some wonderful times. I don’t know, perhaps I’m just panicking over nothing, I don’t know when I’m well off, do I?’ Jane gave a nervous laugh. Amanda saw an opportunity to change the subject. ‘You mentioned Madagascar? I’ve often wondered about booking a holiday there.’ Jane seemed to recollect herself, and the conversation moved into safer waters as the ship cruised south. The men returned from their golf, talking about a re-match. Amanda gave them a smile, but continued reading her Kindle. The sun was getting stronger, and Jane had stretched out in her swimsuit and closed her eyes. Fragments of the men’s conversation interrupted Amanda’s reading. They were talking about their work. Why must men always be so competitive, she thought. She finished the story she was reading, and dozed. When she woke, Harvey and Jane were getting up, explaining it was time for them to get dressed for lunch and their wedding ceremony, or nuptials, as Harvey termed it. ‘Might we see you on the dance floor this evening then? It’s a Strictly Ballroom night.’ Harvey held Jane like a tango dancer, striking a pose. Gerald demurred. ‘Anyway,’ said Amanda, ‘I hope all goes well with the big day!’ They both thanked her and went. Gerald gave Amanda a quizzical glance. “Well, a nice house in Carshalton must be worth a bob or two these days.’ Gerald shrugged. ‘So, are you just going to read that machine all day, or do you fancy a stroll along the deck?’ Sighing, Amanda put her Kindle back in her handbag and gathered up her towel. They did not see Harvey and Jane until late in the evening, in Laurentino’s bar. Gerald liked the quiet piano-bar ambience and a couple of espressos to help his dinner go down, as he put it. He looked pained when the couple came in noisily, Jane, in a flared pink satin dress and silver high heels, giggling, and Harvey, in black tie, holding forth about something or other. Harvey, who already seemed drunk, insisted on ordering more drinks. ‘Got to use up my quota,’ he said, ‘get my money’s worth!’ He hailed a waiter and ordered ‘double brandies all round’ without asking anyone if they wanted a drink. The conversation that followed was rather awkward, as Gerald confined himself to dropping hints about how late it was, and Harvey insisted on loudly telling everyone what a wonderful time he was having. Amanda wanted to know how the ceremony had gone, but Harvey drowned her out. Jane laughed a lot, but did not touch her drink, and Harvey somehow ended up having all the brandies. ‘Well, Mrs Weston,’ slurred Harvey, eventually, ‘time to be off to bed, my darling wife!’ He stood up clumsily, holding out a hand, and swayed as he pulled Jane to her feet. ‘Would you like a turn around the top deck first? Come and walk where the railing is the only thing between you and the ocean, my dearest, hundreds of miles from land.’ He said it with a grin, and Jane giggled as she allowed him to lead her away. Amanda frowned at them as they staggered out of the bar, Jane was hanging on to her husband’s elbow, but it was not clear who was supporting whom. ‘Go after them, Gerald, and make sure they’re okay,’ Amanda said, as the door closed behind them. Gerald stared at her. ‘You’re not supposed to let them see you!’ said Amanda, and then, when he didn’t move, ‘I’ll go then, if you won’t. Stay here!’ She rose and left the bar. Deck 14 was empty, the swimming pool far below was deserted and still, its bright blue water illuminated by submerged lights. Fake palms were dotted amongst the deserted sunbeds, spherical white lamps on stainless steel posts standing around like silent sentinels. Above, a swag of white lights curved from bow to stern. It was too high up to hear the sigh of the sea. A faint hum of music came from the disco five decks below, and a woman’s squeal shrilled out like a night animal. Amanda moved quietly and slowly, keeping to the shadows. There were no security cameras over this part of the deck. She wondered if Harvey was aware of that. Then she saw the pair, on the edge of a pool of light, and held her breath. Harvey had lifted Jane up so that she was sitting on the railing, and as they embraced, he leant her backwards, out over the long dark drop to the water far below. Someone falling from this high could break their neck, just by hitting the water. He was laughing as if it were a joke, Jane giggling, but clinging hard to him. ‘Who-oa!’ he said, as they swayed out over the dizzying precipice, Jane’s arms locked round his neck. ‘Whoa!’ he laughed. Amanda saw Harvey’s hand slide down from Jane’s waist, round her buttock, under her thigh. Was he caressing her, or getting ready to shift her backwards off the railing? Amanda did not know what to do, interrupt them, or remain hidden. She coughed loudly, and then retreated behind a bulkhead. There was a long silence. She could no longer see them, or be seen. Harvey had stopped laughing. Surely if Jane had fallen, she would have cried out? Amanda peered around the bulkhead and then drew back abruptly. To her relief, they were coming towards her. Harvey’s face had a grim and angry expression as he lurched along with Jane at his elbow. Amanda walked quickly away, going back inside through automatic sliding glass doors, across the ship and then outside again through the opposite doors. Before the doors slid closed, she heard Harvey and Jane going back down the stairs. Amanda waited for a couple of minutes, and then rejoined Gerald in the bar. ‘They’re okay,’ she said. Amanda slept badly that night, aware of snoring from the cabin next-door, and seeming to hear Jane’s voice like a refrain, at 2am, 3am, 4am, 5am, coming with increasing sharpness though the partition. Towards dawn the snoring got quieter, and stopped, and Amanda slept more deeply. She woke late, feeling weary. Gerald must have already gone up on deck for his espressos. It was after ten, and there was a commotion, the sound of hurrying feet in the carpeted corridor, opening and closing of cabin doors, the creaking of trolley wheels. She slipped on a dressing gown, opened her door and peered out. A casualty trolley was being manoeuvred out of Harvey and Jane’s cabin. Or at least, it appeared to be Jane’s cabin now. The thing beneath the red blanket on the trolley was clearly not Jane, as she could be heard gently sobbing, as the ship’s doctor patted her hand. Amanda retreated quickly into her cabin and closed the door. She showered and dressed, wondering about what she had heard in the night, remembering that Harvey had been taking antidepressants. She heard Jane leave her cabin, and after a few moments Amanda too stepped into the corridor. Jane could have gone anywhere, but an instinct took Amanda up to deck 14, and, sure enough, there was Jane, leaning on the same railing where only a few hours ago she had been embracing her husband. She had a handkerchief in one hand, but she drew something from the folds, and quickly tossed it overboard, a small white bottle that fell through the air and became a tiny speck in the wake of the ship. 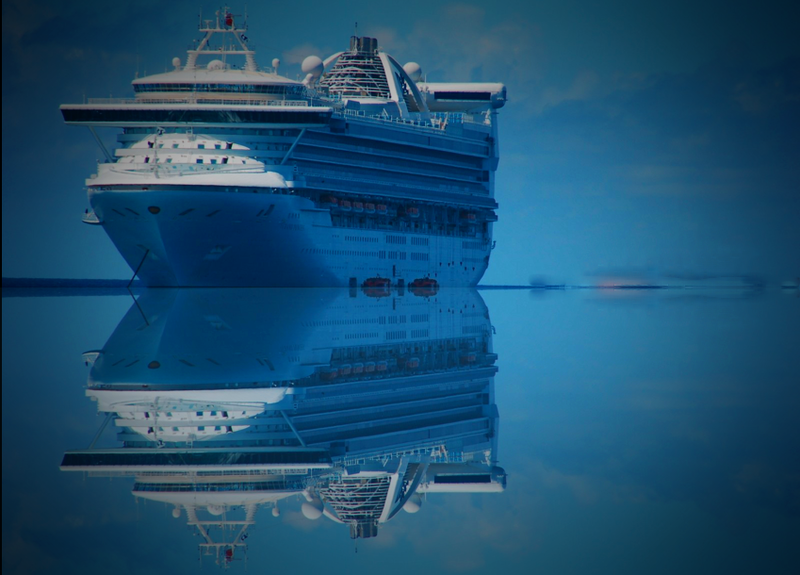 Author’s note: All characters and events are fictional, and cruise ships actually have a very low rate of adverse incidents when you consider the vast numbers of people who enjoy a cruise holiday every year.